Top Notch Material: Overstock Offers Affordable Maternity Fashion and Accesories at a Low Price! Overstock Offers Affordable Maternity Fashion and Accesories at a Low Price! While being pregnant is an exciting time, it can also be very nerve wracking as you start to not be able to wear your clothes, and still want to be fashionable without spending a fortune, right mamas? I know I am constantly looking for maternity clothes at an affordable price, especially since this will be my last baby! One place I have found great prices on ton of maternity fashion is non other than Overstock.com! In the past, I have purchased furniture and accessories from them, but never clothes! 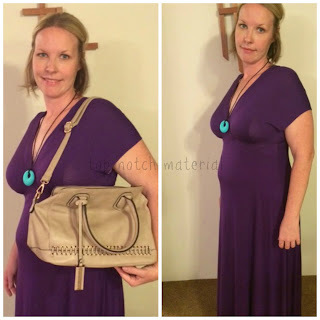 I was lucky enough to receive the 24/7 Comfort Apparel Women's Maternity Faux Wrap Maternity Dress for review. I chose the beautiful purple color. While I am only still in the stage of just looking chunkier and not so pregnant (even though I am well into 5th month of pregnancy) I love this dress and know I will be getting lots and lots more wear from it over the course of the summer. It is so hot here in Florida, and I like to stay cool, and I have found Maxi dresses to be the best way to stay cool, while also covering up and not showing too much skin. This dress can be casual for everyday wear with flip flops, but also looks great with a dressier necklace and sparkly sandals to go to church. My only wish is I had gone a size up while ordering because it fits my bust area a little snug. It is available in wine, purple and black and at a really affordable price! Overstock also sent me an amazing Rimen & Co. 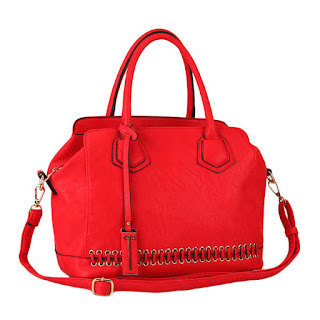 Solid Color with Unique Stitching Pattern Zippered Tote Charm Handbag. This beautiful purse is very spacey and is the perfect way to top of any outfit. It is large enough for a sippy cup and a couple of diapers and wipes for my toddler, but not so big that it is insanely bulky! It is very well made, and affordable at right around $40. While I love the beautiful Khaki color because is goes with so much, it is also available in many other- much more bold colors. This is now one of my new favorite bags and I plan on ordering the red soon!